Speaking of pictures, my sweetie sprung for a nice camera for the 16 year old, and she just about squealed with delight. No, I didn't take any photos of her, which is not only ironic considering her gift, but also just plain stupid because I had charged up my camera battery on purpose just for the task. This means I didn't get a picture of the matching bag, either. But, it's important to note that there was a Coldstone Creamery ice cream cake involved, and I think that may have left me a little distracted! And speaking of distracted, I forgot to take my coupon book to Coldstone Creamery with me, and missed out on the $3 Off coupon for the cake. Wow, what a scatterbrain. And speaking of coupon books, my daughter is selling them for a fundraiser for DECA, which is a marketing club. If you are interested in thousands of dollars in coupons which can be used at retailers in your area, CLICK HERE by September 7th to purchase one that will benefit my daughter's fundraiser! 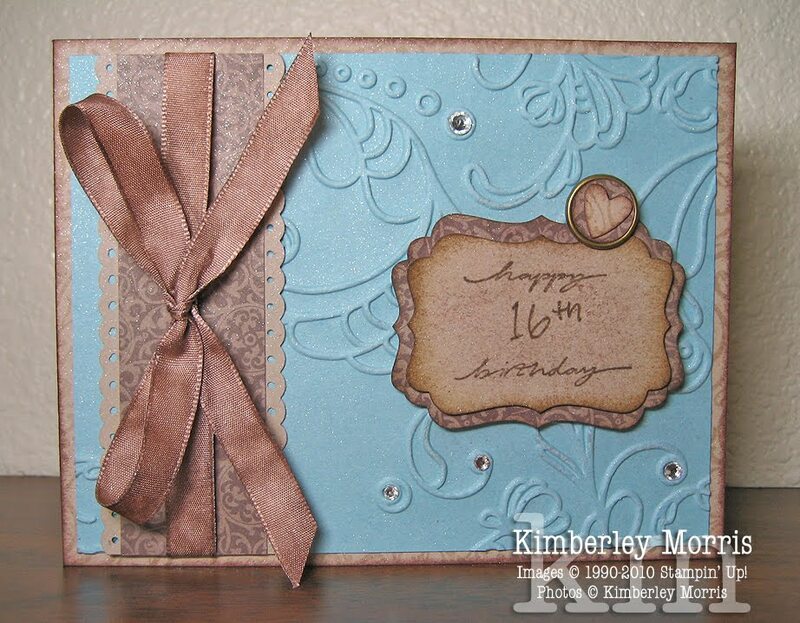 Stampin' Supplies: On Your Birthday stamp set, Sweet Swirls wheel (with VersaMark ink), Stampin' Around Handle, Crumb Cake card stock, Baja Breeze card stock, Elegant Lines Embossing Folder, Soft Suede ink, Decorative Label Punch*, Deck the Halls Designer Series Paper*, Double Scallop Edge Punch, Build-A-Brad, Heart to Heart Punch, 1/2" Circle Punch, Rhinestone Jewels, White Taffeta Ribbon (dyed with Soft Suede ink), Stampin' Sponge, Stampin' Dimensionals. It is a repurposed preserves jar, you could put a gift in a cello bag and put it in here, or just use it for a classy pen/pencil holder...which would be totally cute next to a coordinating notepad holder! Near the top of the jar there were a few markings embossed in the glass that I wanted to cover. So, I printed out some Marina Mist Designer Series Paper using My Digital Studio and backed that with Marina Mist card stock. Stampin' Supplies: Aviary stamp set, Artistic Etchings stamp set (for that flourish design on the scalloped circle) My Digital Studio, Marina Mist card stock and ink, Soft Suede marker (omit the very top of the bird cage), Very Vanilla card stock, Scallop Circle Punch, 1-3/8" Circle Punch, 1-1/4" Circle Punch, Very Vanilla 5/8" Grosgrain Ribbon, Linen Thread, 1/16" Hole Punch, Stampin' Dimensionals, glass jar. Stampin' Supplies: Got Treats stamp set, In Color Assortment Stampin' Write markers which includes Poppy Parade, In Color Assortment of card stock including Poppy Parade, Chocolate Chip marker and card stock, Crumb Cake ink pad (or marker if you want) and card stock, Very Vanilla card stock, 1-1/4" Square Punch, 1-3/8" Square Punch, Modern Label Punch, Word Window Punch, 1" Circle Punch, Fancy Favor Die, Sticky Strip, Mini Glue Dots, Stampin' Dimensionals, staples (for the handle, or you could use brads if you want). And I have to share a picture of my awesome kitty cat...he just turned 11 last month, but he is still super playful. 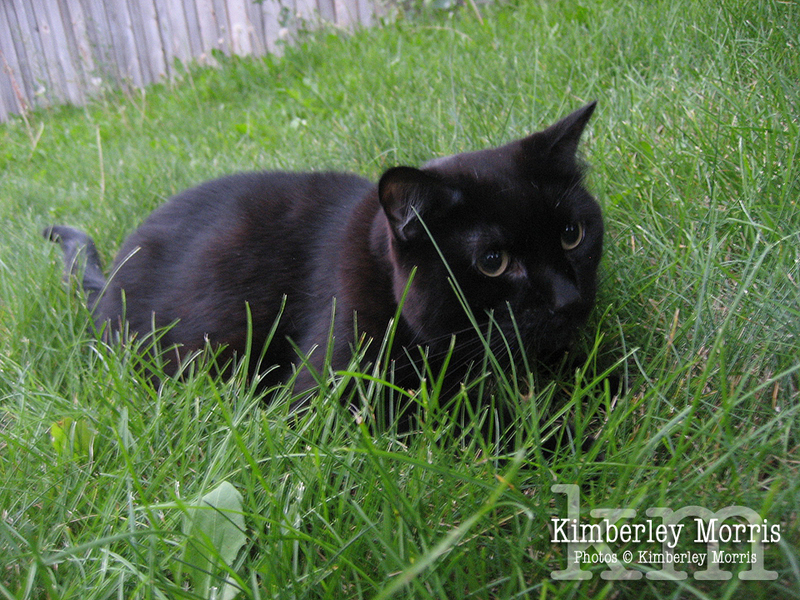 He came outside with me while I was taking pictures, and he pretended to be a big panther waiting in the grass to pounce. Really, he's just a big softie, he likes to play catch and fetch with pine cones. His name is Sneakers, so this is a picture of Sneakers, sneaking! Do you recognize the bandage? 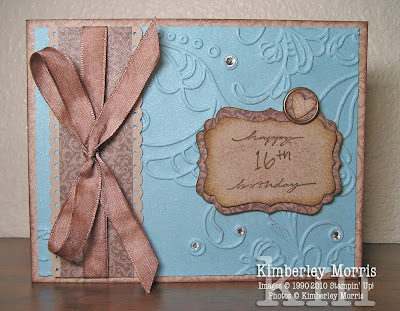 It's the new Petal Card Punch, with two of the rounded tabs cut off, punched out of Crumb Cake card stock. All the dots came from a stamp set called Extreme Elements. The dark dots are Soft Suede ink and the light dots in the background are done in Very Vanilla Craft ink. The letters and the number symbols (little cross hatch thingies) are from the Go Go Boots Alphabet die, and have been cut out of Poppy Parade card stock. The back layer of card stock is Chocolate Chip. I'm gonna be super busy tomorrow, and it was too rainy and windy to get pictures of what I wanted to post, so I'm going to wait on the original post and see if I can get better pictures in the morning. 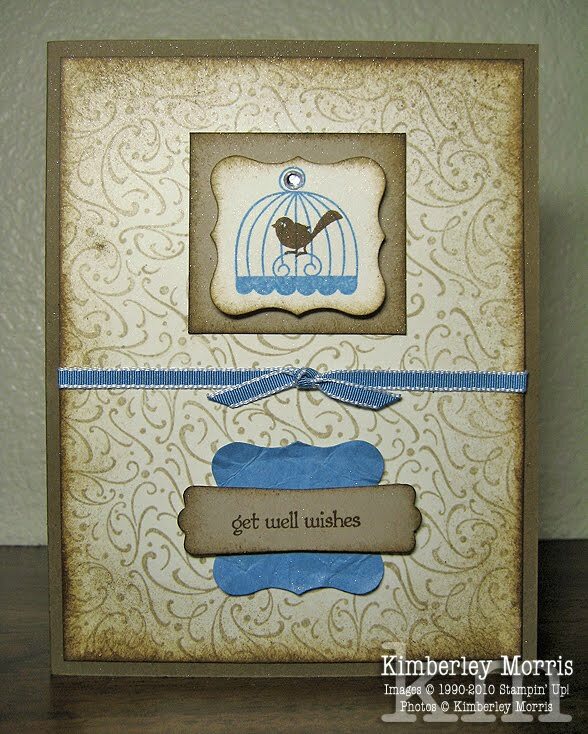 In the meantime, I have another simple card for you using the Aviary stamp set. If I could only have gotten ONE stamp set from the new catalog, the Aviary stamp set would have been it. Oh, and you'll notice I'm still all about the paper crumpling lately, if you check out that Marina Mist Curly Label punched piece under the saying. Check out the handle of that pumpkin treat basket--I braided together three 1/4" strips (one Peach Parfait, one Pear Pizzazz, one Concord Crush). I was so proud of me! The stump at the top of the pumpkin is made using Modern Label Punch. It's just one punch, cut in half, then one of the halves cut in half again lenghtwise, and you just sort of stack them. You do have to flip one of the skinny pieces over to make it work, but it's super easy. All the highlights on the punches and die-cut pieces are done with the In Color markers, which come as a set! 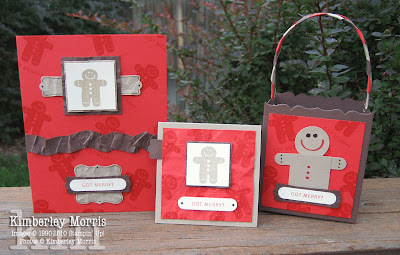 How cool is it that you can use the same supplies to make all three of these projects!?! And that's not all, these projects use only ONE image from the Got Treats stamp set (wood 119114 $24.95, clear 120627 $17.95), pictured below. 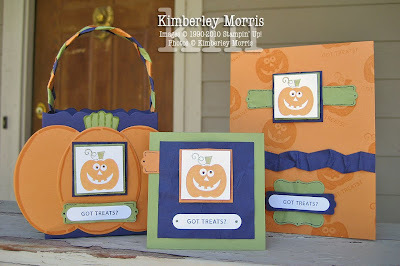 Stick around and I'll show you how you can take this same idea and use it for the other 5 occasion images in the set...and none of these ideas are even using the Milk Carton die, which is what the Got Treats stamp set was designed for! 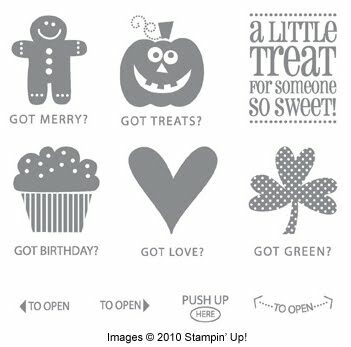 Stampin' Supplies: Got Treats stamp set; In Color Assortment Stampin' Write markers which includes Peach Parfait, Pear Pizzazz, and Concord Crush; In Color Assortment of card stock including same previously mentioned color; Whisper White card stock, 1-1/4" Square Punch, 1-3/8" Square Punch, Modern Label Punch, Word Window Punch, Ovals Die, Fancy Favor Die, Sticky Strip, Mini Glue Dots, Stampin' Dimensionals, staples (for the handle, or you could use brads if you want). I've been spending a lot of time trying to finish "spring cleaning" and get reorganized with the release of the new Stampin' Up! catalog, especially with the color renovations. 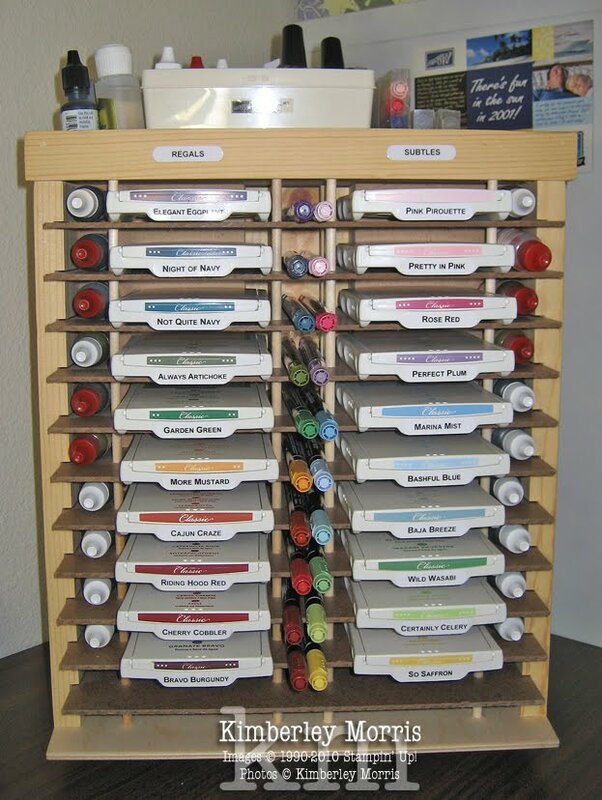 I made some labels for my ink pads...you can see how I use them in the picture below. Click HERE to download the label sheet (uses Avery 5160 label template). I print them out, then cover them with clear self-adhesive laminate on the top, and then punch each one out with the Word Window Punch (119857, $15.95). Then peel and stick the label onto the end of the ink pad...and because of the laminate, you can just wipe the label clean if you smear ink on it! There are also some card stock colors at the end of the sheet of labels, so you can print out a second sheet and use these for the file tabs, containers, or shelves of your card stock. 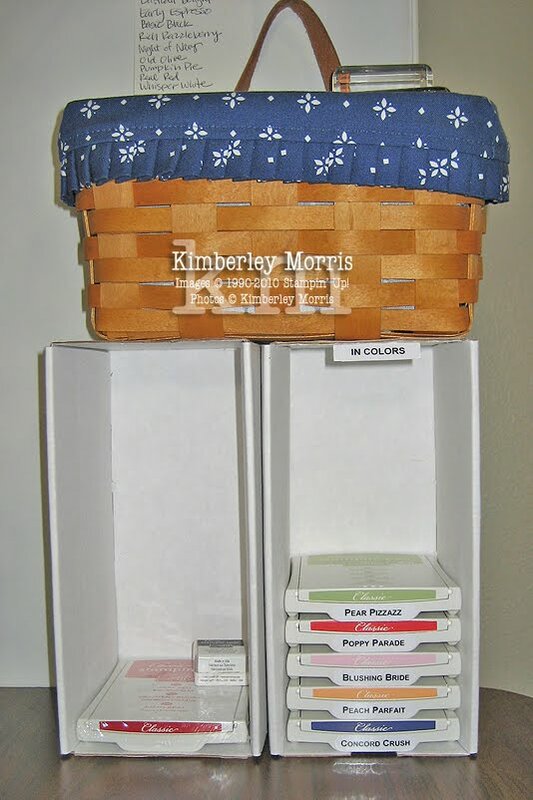 The names of the color collections are also included on the label sheet, so you can place them at the top of the color collection and keep them all together. Below you'll see what I did with my In Color ink pads (and any extras I have lying around), and there's a basket on top of the two boxes with my acrylic blocks in it. While I cannot sell you the ink pad rack I have, Stampin' Up! 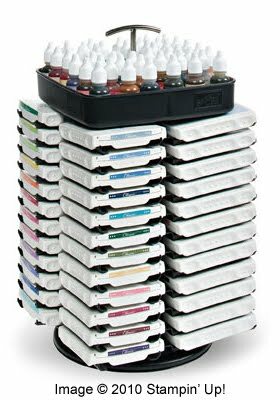 does offer one that rotates 360 degrees like mine, with four columns, each with 12 spaces for ink pads (to hold 48 total), called the Color Caddy (104335, $59.95). 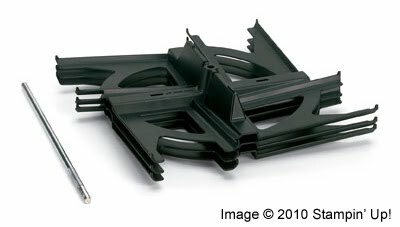 Unlike my behemoth, the Color Caddy only requires a 10" footprint to spin freely, and is about 16-1/2" tall. AND you can purchase an Extender Kit (107063, $14.95) pictured on the right below, which will add 4 columns of 3 spaces each (12 more total), so you can add in your In Color ink pads for this year, as well as the ones that are coming out next year! Peach + Pear + Concord (Grape) = ? I found out that if you combine Peach Parfait, Pear Pizzazz and Concord Crush...you get a Pumpkin! 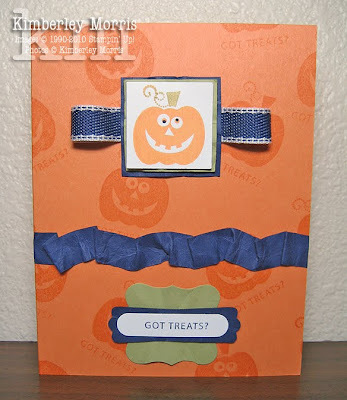 Lol, actually, you get a cute card with a pumpkin on it--but whooda thunk it? Actually, Stampin' Up! did, or at least they realized putting those colors together was a creative combination, and according to the Color Coach, it's one of Shelli's favorites! 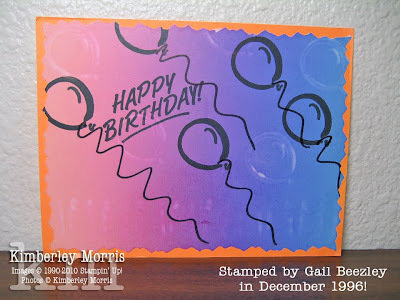 So, it's only fitting that I enter this card into the So Shelli Creative Challenge for this month, called the Color Creations Challenge, which is supposed to feature a new color combination from the new Color Coach. 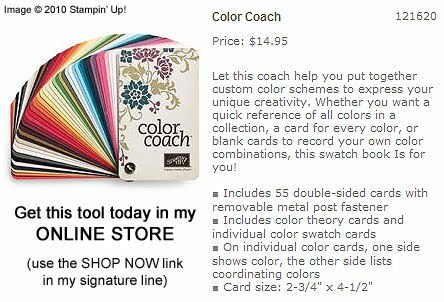 To be honest, I came up with this color combination before I even looked at the Color Coach. I was thinking I wanted to make something sort of Halloweenish to post for Friday the 13th. So, I pulled the pumpkin out of the new Got Treats stamp set, and for some reason it just begged to be inked up with...of all colors...Peach Parfait. Who am I to snub a muse (or a talking vegetable stamp with googlie eyes for that matter), so I indulged it. Then I thought, "Wouldn't it be great to make a card using just In Colors?" The pumpkin said, "Awesome, gimme some of that Pear Pizzazz", and I did. Then I thought I needed something dark and deep like midnight, and the pumpkin sighed and rolled his eyes (though that was hard to distinguish from all the googlie-ness) and said, "Duh...try Concord Crush". To which I responded, "Don't sass me or I'll gut you, stick a candle in your carcass, and put you out on my front porch after it gets dark!" Just kidding. Anyway, I really LOVE the combination and went to jot it down on one of the blank spaces on my Color Coach for future reference. But first I had the foresight to check each of the cards to see if that combination was already listed somewhere. Lo and behold, it was already on the back of the Concord Crush card. Seriously, how cool is that? 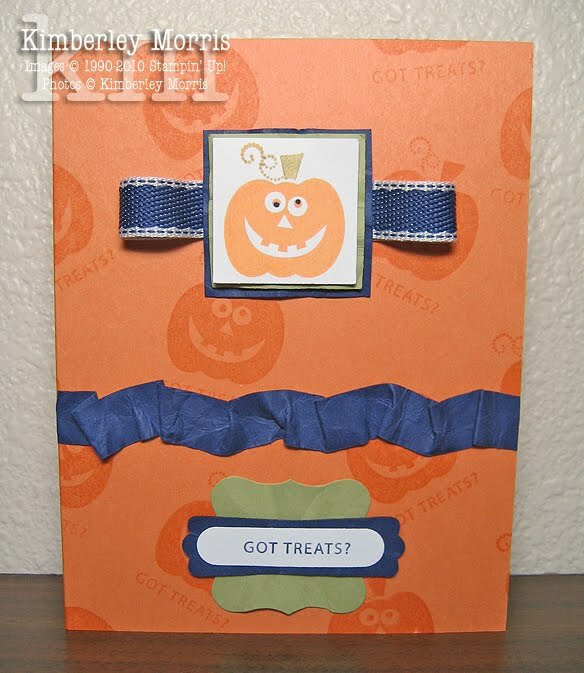 Most of the card stock layers on the card were smooshed and wadded and then unwadded, to give them some texture because, well, the pumpkin told me to do it. And quite frankly, I was getting tired of that egghead bossing me around, and though I'm not proud of it, I admit that I smooshed in anger. 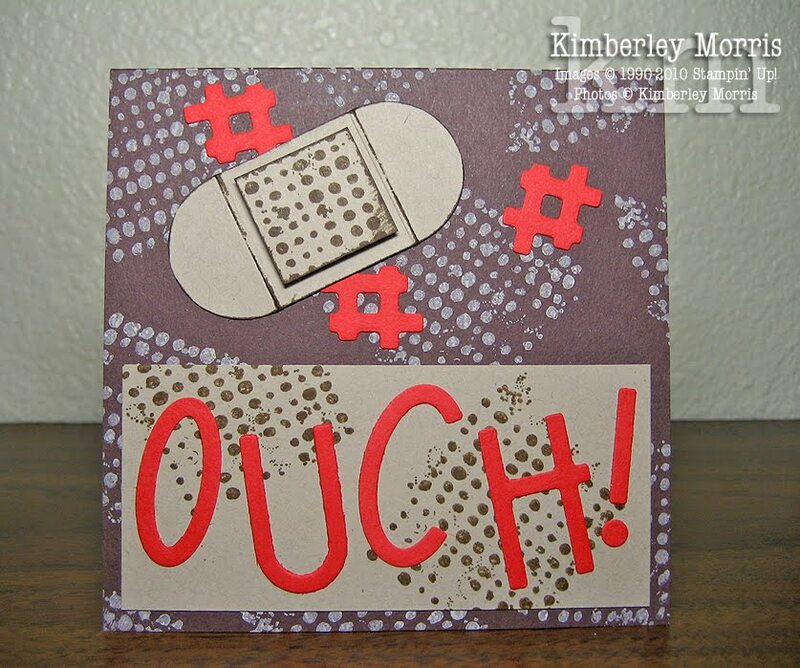 So, I guess I could call this my Shelli's Color Combo Creation Card featuring the Angry Smooshing Technique...? Nah, I wouldn't call it that, you'd think I was out of my GOURD! Lol, sorry, I couldn't resist. Who are you going to make a "keeper" for today? 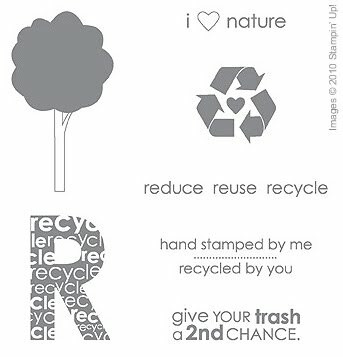 I was invited to participate in a multi-demonstrator event in Colorado Springs this month, designed around the So Green stamp set (pictured below), and recycling. It's called the So Green Stamping Session, and will be held on Saturday, August 28th from 9am to about noon, at the Stetson Hills Police Station in North Colorado Springs. This is a family friendly event, and every registered adult may bring one child helper! Registration is $20, and includes the So Green stamp set and all the supplies you'll need for your earth-friendly projects. Important: you must register no later than August 18, 2010 so that I may order your stamp set to arrive in time for your use at the event. Click HERE for a flyer with all the details and a week's worth of recycling projects you can do, even if you don't attend the event! 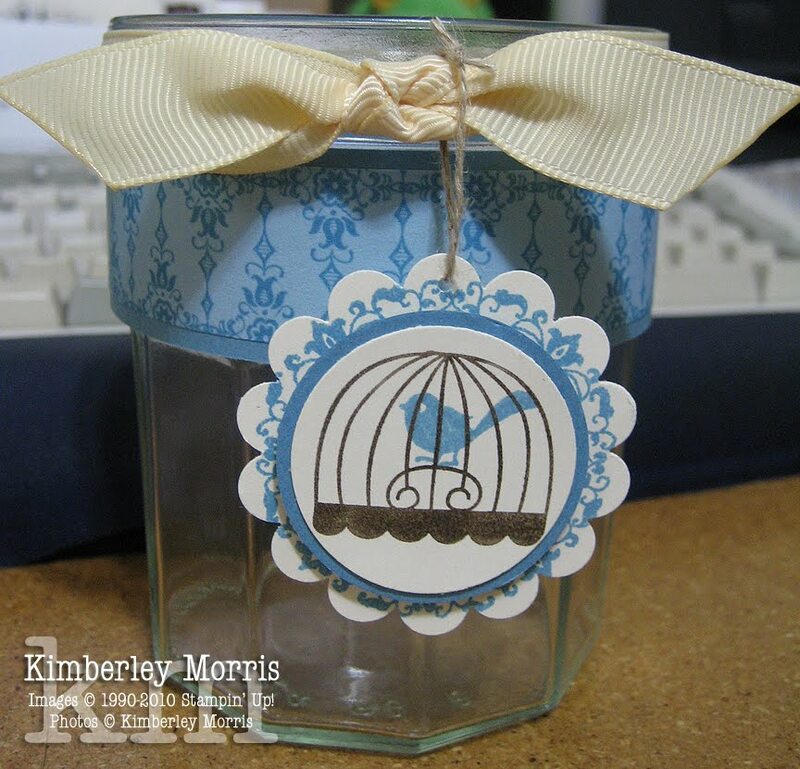 At the event, you will make and go home with your own recycled paper, THREE cards, and a repurposed jar (which I will provide for you!). We'll provide bottled water and snacks. There will also be displays of items created with recycled and repurposed materials, as well as a presentation about Stampin' Up! 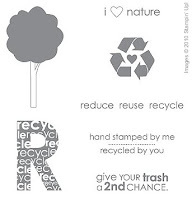 's green policies, and some "green" activities you can do in your crafting, shopping, and everyday life. Call me at 719-205-5957 or email me today to reserve your spot (and a spot for your child helper, if you'd like to bring one). You can pay in cash, a local check, or ask me to email you a Google Checkout paperless invoice you can pay with a credit or debit card. CAN'T MAKE IT ON THE 28th BUT STILL WANT TO PLAY? If you would like to participate but cannot attend, contact me about ordering a "kit" for an additional $15. 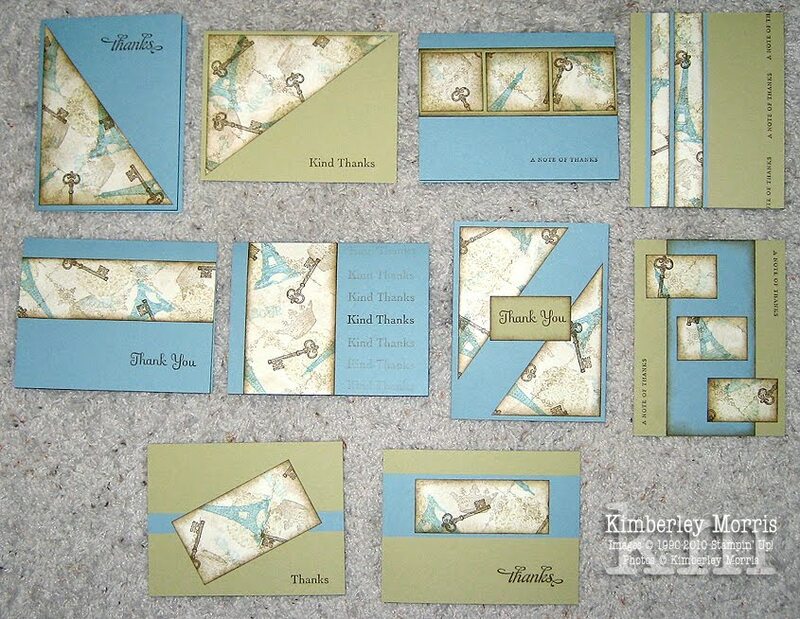 I will mail you your stamp set, along with supplies and instructions, and a Marina Mist Stampin' Write™ Marker. However, I MUST receive your payment by August 18th. Whoo Can Make Three Cute Cards? The answer to that title question is...you! 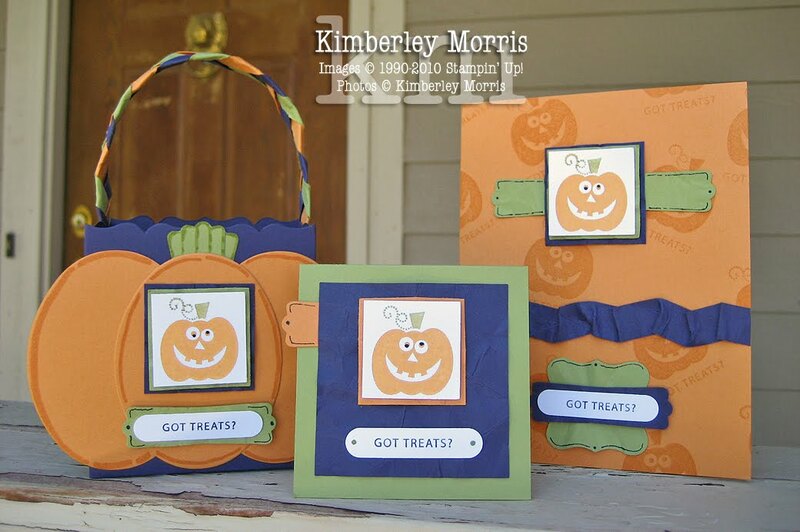 You can make the THREE cute cards below for free when you come to my Workshop in Colorado Springs in just TWO days, on August 12th at 6:30pm. I only ask ONE thing, and that is to RSVP NOW by emailing me or calling me at 719-205-5957. You see, I can share what I know, and you can read every post I've ever published to my blog, but you cannot get the Full Workshop Experience unless and until you are right here with me! Imagine yourself baking cookies in your kitchen with an expert dessert chef...the energy of creation and learning, knowing you are using the right tools and ingredients, and tasting that moist and chewy first bite of a perfectly baked homemade cookie warm from the oven. Now, imagine yourself watching a video on your computer of that chef showing you how she makes cookies in her own studio kitchen. It's just not the same experience. My message today to you today is, if all you are doing is blog hopping to recreate stamping experiences you've seen others enjoy, you can have something more! You DESERVE the Full Workshop Experience--you deserve to taste the cookie dough, smell the cookies baking, and savor that cookie warm from the oven. 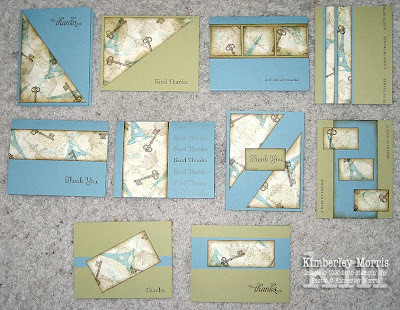 So, do yourself a favor, and attend a Workshop with me if you live in or around Colorado Springs, or call 1-800-STAMP-UP to find a Stampin' Up! Demonstrator in your area, and ask your local demonstrator for the Full Workshop Experience! And, if you have your Workshop before August 31st, with $350 or more in sales, you will receive an EXTRA BONUS: $25 in Additional Hostess Benefits (that's FREE merchandise of your choice). So, the question is not, "Why would you want to have a Workshop? ", the question is really, "Why WOULDN'T you want to have a Workshop?" Call today...it's time to TREAT YOURSELF :-) Take a bite of the Workshop cookie, it's naturally fat and sugar free, has no calories, and tastes delicious! Sorry I've been MIA for so long--the pnuemonia really kicked my behind for the entire month of June and half of July, then there was the AWESOME Stampin' Up! Convention I attended...and I drove to that. It was a beautiful drive, but going through Vail at 9,000+ feet kind of made my chest hurt. Convention was action-packed, and if that wasn't enough to recover from, I got stuck on the top of the mountains for over an hour while driving back through Vail. I guess my lungs were already kind of fragile, then I wore myself out running around all over at Convention (I even had to pass on a couple of events), and then sitting there at 9,000+ feet for over an hour while coming home, just really poured salt in the wound. I was kind of out of it for about a week after Convention. I'm still feeling a little low-energy, but I'm SO wanting to get things done, I'm just trying to push through! If you live in the Colorado Springs area and want to do this Make & Share class at my home, just email me with the date and time you'd like me to open a class. 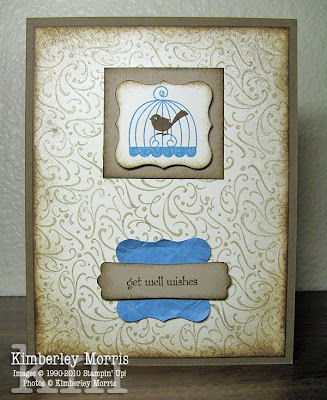 The class is $25 which INCLUDES the Artistic Etchings stamp set, 1/4 Stampin' Sponge, supplies to make all 10 cards, and 10 envelopes for mailing your masterpieces. When you and five of your friends pre-pay, it becomes a Private Class, and you may choose whether to host it in your home or mine!